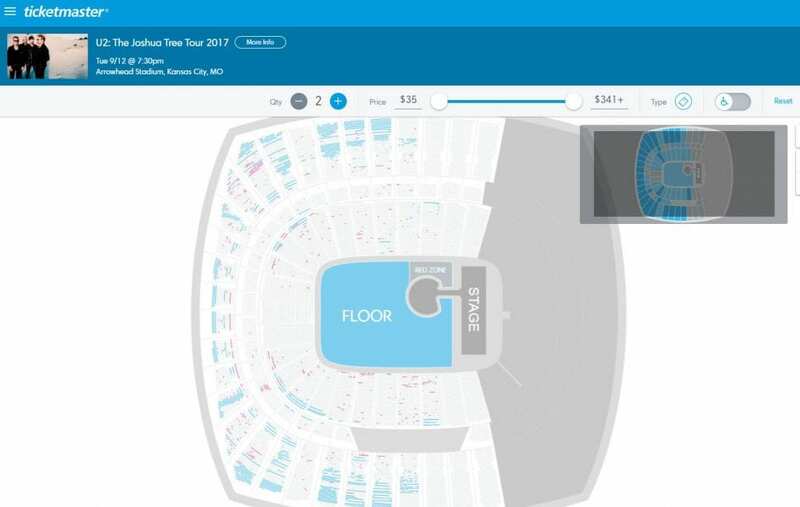 Did U2 Drop its Kansas City Prices to Meet Lower Demand? Did Ticketmaster Drop U2 Prices to Compete With Secondary? We received an interesting email on Thursday night from a frustrated fan of Irish rockers U2 somewhere in the greater Kansas City area. I did a quick internet search and am surprised that no fans are complaining about the fact that U2 ticket prices were lowered sometime recently for upper level side seats from $100 each from the onsale back in June to $35 for similar seats that can be purchased today on Ticketmaster. I purchased 2 tickets in Sec 346, Row 12 for a total of $239.10 on June 12. On Ticketmaster today, seats in Sec 346, Row 7 have been reduced to $35 per ticket plus fees (so $102.60 total for 2 tickets). That’s nearly $140 LESS than what they were charging a couple months ago. This is outrageous to me! Has this been occurring across the country at other U2 events? Is this something specific with Arrowhead Stadium? Doesn’t seem ethical to me that the primary provider can lower prices whenever they see fit, despite poor ticket sales. Am I wrong in my thinking? We looked up the prices on Ticketmaster.com, and sure enough, tickets in the upper level of the stadium are on offer for $35/each plus fees. We attempted to contact Ticketmaster’s communications staff on Friday morning for clarification on whether or not prices were dropped for the show, as well as whether or not fans who had already purchased at the higher price might see a refund for the difference in the event that had happened. We did not receive a response as of late afternoon Friday. A look at the primary sales information available doesn’t seem to indicate that the tickets at this concert were using a “dynamic pricing” model, which is occasionally in place to adjust prices to market demand. It is possible that this was the case when the original tickets were sold. What is clear is that there are still many seats available for the arena show in Kansas City, particularly in the upper reaches of the stadium where the fan who emailed us bought his tickets. It would make sense if the tickets were priced above the market to move them down and get the inventory out the door. The question, however, is how you explain that to people who bought at the above market price, only to see the section around them fill up for less than half the ‘get in’ price. A brief look at other stops on the tour – including Friday night’s Minnesota show – indicate that there are tickets available for the tour in fairly large numbers. Earlier this week, we saw a broker advertising $12 seats for the concert in Buffalo, NY (but it was too late to check whether or not any tickets had been re-priced on the primary market). It is also entirely possible that the irate reader has misplaced their anger, and actually purchased a higher priced ticket in the first place. Tickets on other stops of the tour appear to start at the same $35 price point save for the final gig in San Diego, where the upper reaches of the stadium are $100/each. It is just difficult to imagine that a ticket several rows below the ones they purchased wouldn’t have been the same price or more expensive in the original on sale. We’ll update this story with a response from Ticketmaster if any is received. If any readers have any insight on the pricing for this event, they can email us at [email protected].